There’s absolutely no shortage of exciting attractions to choose from in Charlotte, North Carolina whether you’re in town visiting or a local. Included in those many attractions are several museums that are brimming with a wealth of information and artifacts on a variety of subjects that range from science and history to art. 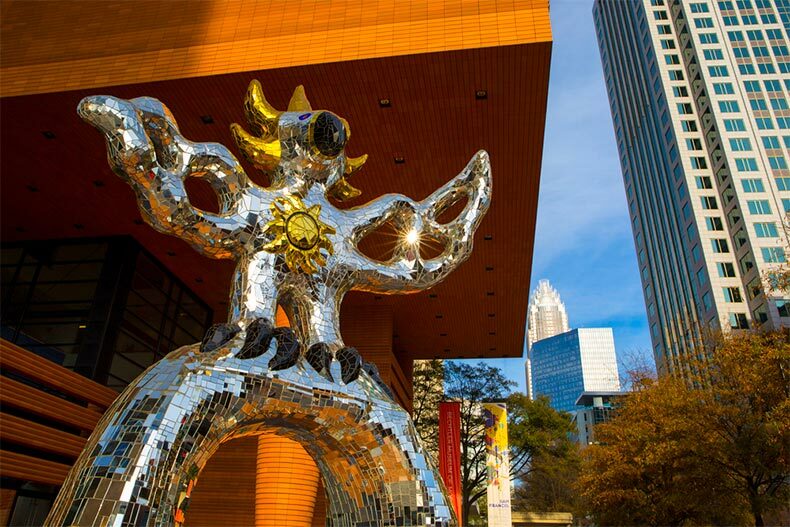 Located in the heart of Uptown Charlotte, the Bechtler Museum of Modern Art boasts a collection of nationally recognized exhibits that includes works by important artists of the mid 20th century, including Pablo Picasso and Andy Warhol. As an added bonus, several of the museum’s pieces have never been on display before in the U.S. as they were part of the Bechtler family’s personal art collection in Switzerland. The museum also hosts a myriad of activities and events throughout the year that range from special jazz evenings and family days to guest lectures with renowned artists from all over the world. Admission is $9 for adults and $5 for youth ages 11-18. The entire family will enjoy exploring all the Discovery Place Science Museum has to offer. Made up of a combination of both permanent and rotating exhibits, Discovery Place features a wide variety of interactive activities, science experiments, and even its own aquarium. Additionally, the science museum has a planetarium and the largest IMAX theater in North Carolina, which is a whopping three stories high and offers daily screenings. Tickets are $17 for adults and $13 for children ages 2-13. IMAX tickets can be purchased separately for $10 for an adult and $9 for a child. Follow the Queen City’s long journey from the tumultuous days after the Civil War to the height of the city’s reign as a textile powerhouse to its transformation into the major financial hub it is today at the Levine Museum of The New South. The museum’s central exhibit, Cotton Fields to Skyscrapers gives visitors an in-depth look at the city’s fascinating past through thousands of historic images and artifacts that have been preserved and restored. Tickets are $9 for adults and $5 for kids. The expansive, five-story Mint Museum Uptown is home to a variety of traveling and permanent collections that include a multitude of American, Contemporary and European artworks. A sampling of current exhibitions includes Arts of Africa — a collection of art that takes a deeper look into the religions and cultures across Africa, Portals of The Past: British Ceramics 1675-1825 — a collection of 18th-century British pottery and porcelain, and Wares of The World: Asian Influence in Contemporary North Carolina Ceramics. The Mint also has a studio where guests can create their own works of art, a museum store, and restaurant inside the Mint. Tickets are $15 for adults and $6 for children ages 5-17.